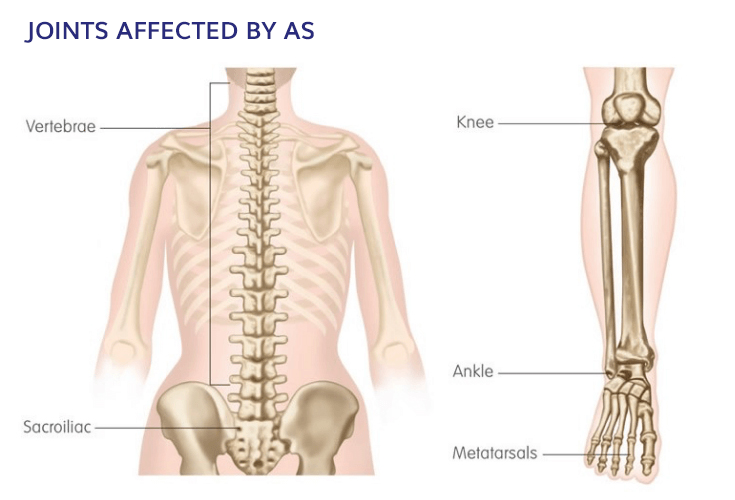 Ankylosing spondylitis (AS) is a long-term (chronic) condition in which the spine and other areas of the body, such as joints, tendons, ligaments and bone, become inflamed. If left untreated, the inflammation can cause the bones in the spine to join together (fuse) and stiffen. The cause of AS is not completely understood, but research suggests that in many cases there seems to be a link with a particular gene called HLA-B27. Having this gene doesn’t necessarily mean that you will develop AS. It is estimated that 9% of New Zealanders have the HLA-B27 gene; however, only 13 in every 1000 people (1.3%) with the gene will go on to develop AS. It is thought that the HLA-B27 gene may make you more vulnerable to developing the condition and that other factors, possibly environmental, are necessary for the disease to appear in susceptible people. People with a family history of the condition, especially those with the HLA-B27 gene, have a higher risk of developing AS than the general population. Some people (between 5 and 10%) who develop AS do not have the HLA-B27 gene, which suggests that other genes may also be involved. Like other similar conditions, it is thought that AS is caused by an abnormal immune response. An immune response usually settles down after an infection or illness but in a person with AS the immune system stays in ‘attack mode’. Because there is no infection left to fight, the immune system targets healthy tissue. AS is more common in men than in women and it tends to be more severe for men. Symptoms of AS often first appear in teenagers and young adults; it is unusual for those over 40 to develop AS. Because other causes of back pain are much more common, AS is often not diagnosed as fast as it should be – it’s often dismissed as a back strain from sport or physical work. Young men tend to put off going to the doctor, but fast diagnosis and treatment may help to relieve the symptoms of the condition, and help delay or prevent the process of the spine fusing and stiffening. The symptoms of AS usually develop gradually over several months or years. The symptoms may come and go, and improve or get worse, over time. Early symptoms of the condition include back pain and stiffness, which is often worse in the morning or after resting during the day. The joints that join the lower back to the pelvis (the sacro-iliac joints) may be inflamed causing pain in the area around the buttocks. Inflammation may also cause pain under the heel, at the back of the heel, or in the chest. Over time, long-term inflammation can lead to complete loss of movement in the neck and back. At worst the affected joints in the spine may become fused and inflexible, resulting in severe curvature of the spine. Unlike most other types of arthritis, where the inside of the joint is inflamed, in AS the inflammation occurs mostly on the outside of the joint where ligaments, joint capsule and tendons attach to bone. This can include the spinal column and, importantly for diagnosing AS, the joints between the lower back and pelvis. There is no known cure for AS but treatments are available that can help to manage the symptoms and may slow the progression of the condition. The two most important treatments for AS are exercises and anti-inflammatory medication. Stretching exercises have been shown to help maintain a normal range of movement in the spine and to help prevent the spine from becoming stiff and inflexible. It is important to stretch all parts of the spine, including the neck. Your physiotherapist can provide advice on which exercises you should perform and how often. Yoga and pilates may also be helpful for stretching the spine, and can be included in your stretching program. Non-steroidal anti-inflammatory drugs – or NSAIDs for short –can help to reduce the pain and stiffness associated with inflammation. They are usually taken after food to reduce the likelihood of an upset stomach. There are some people who shouldn’t take NSAIDs so you should check with your doctor or pharmacist before taking them. The most commonly used example is prednisone. These drugs suppress the immune system and shut down the inflammatory process. Steroids are generally used to bring the disease under control but they don’t prevent the damage to joints. Steroids are used usually as short courses because of the risk of side effects from long-term use. Biologic medicines are used when other medications have been tried but severe symptoms are still present. Medicines like Enbrel® are made from human proteins that get right to the source of the problem. Enbrel catches onto and restrains another protein already in your body called tumour necrosis factor (TNF), which is a naturally occurring chemical messenger in your bloodstream. Too much TNF often plays a part in causing the pain and stiffness in AS. Enbrel works by blocking the effects of too much TNF which means that it cannot start the process that leads to inflammation. Sometimes surgery may be necessary, especially if you experience damage to your joints such as your hips, knees and ankles. Some people with AS find therapies like homeopathy, acupuncture, massage, using a TENS unit (electrical stimulators for pain) and naturopathy helpful in managing symptoms. These treatments have not been shown to slow the progress of the disease and should only be used alongside NSAIDs and stretching exercises. Relaxation techniques such as deep breathing and meditation may also help. Smokers who have AS have more spinal damage than non-smokers who have had the disease for the same length of time. Smoking also contributes to other complications in AS.